I went to school for Tish’s conference this morning. All is well enough. She’s doing fine- especially in her own estimation. As we were waiting in the hall, I saw [some] art work on the wall. 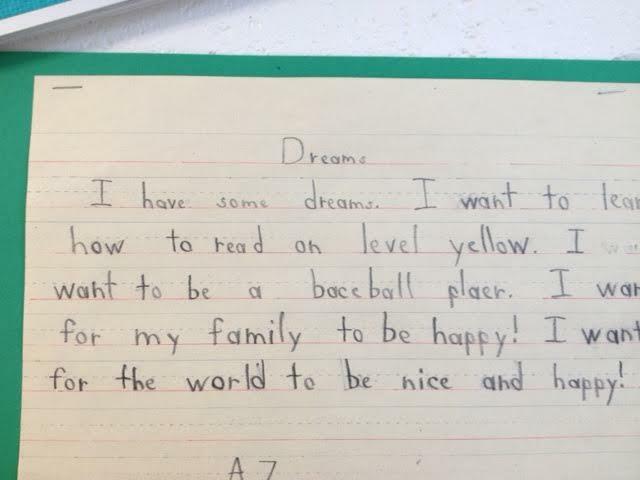 Tish explained that the assignment was to write about their biggest, boldest dream. Tish’s poster wasn’t done yet. I asked what her dream was and she said: “To be Taylor Swift and for my mommy to be happy.” Oh, I said. Then she added: “Everyone at my table wrote ‘I want my mommy to be happy!’” Oh, I said again. They’re not saying: My dream is for my mom to be perfect. Or my dream is for my mom to be thinner or better looking. Or cooler. Or have more friends. Or have better things. Or to have had a prettier past. Or have a cleaner, bigger, nicer house. Or be richer. Or be divorced or reunited. Or work less or more or outside the home or inside the home or part time or what-have-you. None of that. Just: My dream is for my family and my mommy to be happy. But you know what- none of those papers said that, “My dream is for my mom to stop snapping.” None said, “I wish my mom would stop being so anxious and just relax and be more like Jesus or Buddha.” Their dreams were less about us in relationship to THEM and more about what they really want for US. As PEOPLE. They want us to be happy. Because they love US. And because they know, likely, that they are supposed to learn how to be happy during this beautiful life from us. And so if we’re slugging our way through life without joy- they are probably thinking- deep down– if she can’t pull some joy out of life- how will I? And so those posters served as some SMELLING SALTS for me this morning. They woke me up. And I thought: WHAT MAKES ME HAPPY? What is one thing that I could do today that has NOTHING TO DO WITH THE ROLES I PLAY and just FEEDS MY SOUL?